Shelly Francis and Doktor. Photos: ©SusanJStickle. 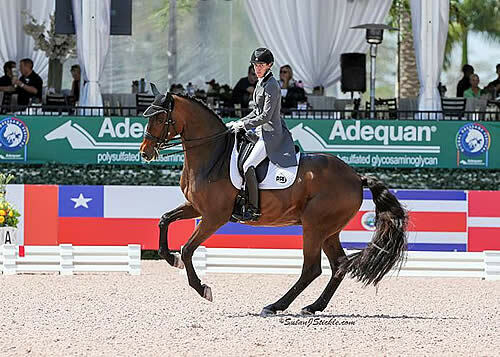 Wellington, FL – March 17, 2016 – Shelly Francis (USA) and Doktor, who have been campaigning at the Adequan® Global Dressage Festival (AGDF) circuit all season, collected a win this afternoon in the FEI Grand Prix CDI 3*, presented by The Dutta Corporation. Competition at AGDF continues tomorrow with the FEI Grand Prix Freestyle CDI 3*, presented by The Dutta Corporation, at 3:15 p.m. and the “Friday Night Stars” FEI Grand Prix Freestyle CDI 4*, presented by Havensafe Farm, beginning at 7:00 p.m.
Francis and Doktor won with a score of 70.180%. 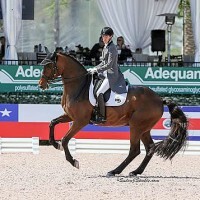 Olivia LaGoy-Weltz (USA) and Rassing’s Lonoir, in their second FEI Grand Prix start together, earned second place with a 69.940%, while Laura Tomlinson (GBR) and Unique took third place with a 69.100%. 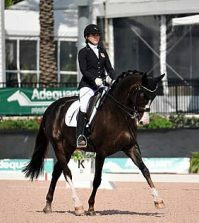 On the second day of dressage competition at Palm Beach International Equestrian Center (PBIEC) this week, Francis and Doktor entered the ring late in the order, and moved fellow American LaGoy-Weltz out of the top position, which she held for majority of the class. 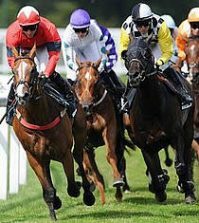 Displaying consistent relaxation and rhythm in their tests, Doktor’s presence in the ring is progressing, according to Francis. In just their second CDI competition at Large Tour together, LaGoy-Weltz and Rassing’s Lonoir, who were very successful in Small Tour classes last year at AGDF, proved that they’re a combination to watch at the Grand Prix level this year and are becoming comfortable and confident with the movements at Grand Prix level. 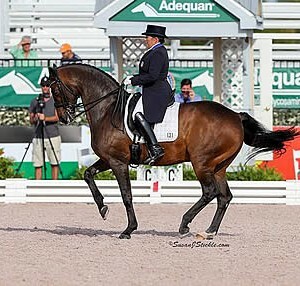 Tomlinson has had a successful two weeks aboard both of her Grand Prix mounts, Rosalie B and Unique, owned by her parents, Dr. & Mrs. Bechtolsheimer. She found a confident and rideable horse beneath her today in the ring, as Unique, one of her greener mounts, concluded one of her best tests yet. “[At AGDF] is the first time that she’s been able to do a few Grand Prix shows in a row, which has helped us massively. She was a different horse to ride today than she was when she first got here. There are still parts of the test where she looks too big and not together to show off what she can really do and get those marks that she could get,” elaborated Tomlinson. “From a rideablity point of view, I’m thrilled. It’s really the best she’s been to ride, and she’s trying very hard for me. She’s obedient, and she’s never going to say no to anything. “I’m thrilled with our progress and I feel like we also have a lot to build on as well,” continued Tomlinson. 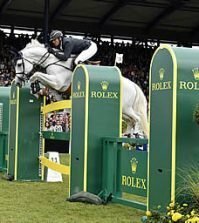 All three riders will head in their own separate directions at the end of circuit in just two weeks, as Tomlinson and her team depart for Europe this Sunday, while both LaGoy-Weltz and Francis will contest the final CDI of the season at AGDF before reaffirming plans for the rest of the year. Francis and Doktor will represent the United States in the Stillpoint Farm Nations Cup CDIO 3* at AGDF in two weeks, while LaGoy-Weltz and Rassing’s Lonoir will contest their final CDI 3* Grand Prix at AGDF. Leida Collins-Strijk (NED) and Don Tignanello maintained their winning ways moving into the second day of CDI 1* competition. 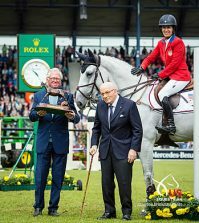 The duo won the FEI Intermediaire I CDI 1*, presented by Mike & Roz Collins, with a score of 72.289%. Tina Irwin and her own Laurencio claimed second place with a 70.368%, while Lisa Wilcox (USA) and Gallant Reflection HU, owned by Horses Unlimited, captured third place with a 68.658%. Competition at AGDF continues tomorrow with the start of the 2016 Florida International Youth Dressage Championships in the Van Kampen Covered Arena at PBIEC, along with the FEI Grand Prix Freestyle CDI 3*, presented by The Dutta Corporation, beginning at 3:15 p.m., and the “Friday Night Stars” FEI Grand Prix Freestyle CDI 4*, presented by Havensafe Farm, at 7:00 p.m. under the lights at The Stadium. For more information on AGDF, please visit www.globaldressagefestival.com.